For the Israeli Society of Critical Care Medicine, July 12-14, a meeting I previously reviewed on Postcards from the Road. The real fascination to me was learning about this fascinating place, the Jews, some things about orthodoxy and how a combined Church and State works. Sadly I missed a visit to Masada because of the intense heat. Will remain on my bucket list for another day. The old city of Jerusalem is an interesting place with an over three thousand year history. It’s split up into four sections, Christian, Jewish, Moslem and, interestingly an Armenian quarter dating back to 95 BC. Unlike the majority of Christians in Israel, Armenians ethnically and religiously separate, a homogeneous group, intermarrying over the years and keeping their culture intact. The Christian quarter contains what is traditionally said to be the path of Christ carrying the cross to Golgotha, the hill where the crucifixion took place. Constantine built the Church of the Holy Sepulcher around the whole site around 333 AD. Stations are identified where certain events occurred during the trek with the cross, and a burial site said to be compatible with what it would have looked like at the time is a short distance from the preserved rock formation the cross is said to have been erected upon. There is some suspicion that this whole arrangement has been molded as a tourist attraction as it would be highly unlikely that anyone would know exactly what happened at any of the stations 2000 years ago. Similarly, in the town of Tombstone, AZ, the reconstructed town cemetery probably doesn’t really contain many of the infamous figures of the old West, but the site is a popular tourist visit. One of the high points was the food. The cuisine was just incredible, some of the best food I have ever had. The wine (grapes grown locally) was also excellent. Very authenticBeef Stroganoff in one bistro by the sea. Lots of tasty local dishes prepared in picturesque restaurants. A real treat. Starts with photos in and around Tel Aviv. Then Jerusalem, grave sites of Jews who live in other areas but come back and be buried in Israel. The Wailing Wall, some open markets, Christian areas. Then the Roman era ruins of Caesarea, much of which is remarkably preserved. A road unearthed, an aqueduct that goes for kilometers, well preserved statues. A chariot racetrack like in Ben Hur, rooms with much of the original floor detail intact. On the plane, I read the latest and seemingly most informative book about “Lawrence of Arabia” T. E. Lawrence, his life and accomplishments: “Hero”, by Michael Korda (2011). It turns out that his involvement in the shaping of the Middle East was very significant and interesting. I have endeavored to summarize some of the fascinating history below just to possibly pique your interest in reading more. In 1914, Turkey joined World War I on the side of the Germans and specifically against their traditional enemy, Russia. The British analyzed the situation and decided the cheapest and safest way to neutralize the Turkish war effort was to tie them up with an Arab revolt in what was then Arabia, a major part of the Ottoman Empire. In the spring of 1915, the Allies (Britain and France) undertook operations in the Dardanelles intended to break the back of the Ottoman Empire with one blow and open the waterways for the passage of supplies to Russia. Amphibious landings at Gallipoli failed due to unexpected Turkish resistance. Subsequently, the Ottoman army defeated a British expeditionary force at Baghdad in 1915. It was quickly discerned that the Brits weren’t adequately equipped for a desert war. It was decided to pay the Bedouin tribes of the area to harass the entrenched Turks. The Bedouins were happy to accommodate in return for gold sovereigns. In this way, the Turks could be kept busy on an irrelevant front and out of the major European theater. Into this arena arrives lieutenant T. E. Lawrence, a square-peg-in-a round-hole minor military mapmaker with archeology experience, selected to go to Arabia as an intelligence officer because of his extensive knowledge of the area and his fluent Arabic. His charge was to look around and report to his superiors in Cairo what was going on in the desert. What was going on was that the Arab revolt on horse and camel back, using outmoded shoulder arms including some muzzle-loaders, was out gunned and out manned by the Turkish aircraft, artillery and mechanized army. At best, the Arabs were simply an irritating inconvenience for the Turks. Lawrence’s superiors had no idea what they were getting involved with by sending him to Arabia. Lawrence had a strong interest and loyalty to the Arabic dream of throwing out the Turks and establishing a Pan-Arabic political State. Aligned with Prince Feisal, Lawrence quickly evolved to a position of guerilla leadership with the aim of throwing the Turks out of Arabia. He became involved n blowing up Turkish trains and tracks, tying up the Ottomans with repair to maintain supplies to their occupation troops. The big break in the offensive came in 1917. The route to protected Damascus (held by the Turks) was guarded by the 12-inch guns lining the mountains surrounding the port city of Aquaba, part of what is now Jordan. It was virtually impossible for an invading party to approach Damascus via the Red Sea. The entire defense was pointed toward the sea. It was inconceivable that Aquaba could be approached via the extended and brutal inland desert route. On 6 July 1917, Lawrence and his rag-tag Bedouin followers survived a month is one of the most inhospitable deserts in the world (The ”Sun’s anvil”) to overwhelm Aqaba’s small and unprepared Turkish garrison from the unprotected rear. Once Aquaba was taken, Damascus lay unprotected. Accordingly, Lawrence and his Arab invaders entered Damascus in October 1918. Lawrence was instrumental in establishing a provisional Arab government under Faisal, which, following localized arguing and bickering amongst the various factions, collapsed quickly. The French Forces entered Damascus shortly thereafter, destroying Lawrence’s dream of an independent Arabia. Of course, it was always a foregone conclusion that the British and French never had any intention of giving up the spoils in favor of an independent Arabic nation. It continues to be a bit of a controversy whether Lawrence knew about the (poorly kept) secret Sykes-Picot Agreement, prospectively dividing up the geography of the area to benefit the Brits and the French, with a nod to the Russians. It’s inconceivable that he wasn’t aware of this agreement. He had years of experience in the area and it’s history and he almost certainly knew the transparent motives of his superiors. It’s thought that his ultimate reasoning was to get the Arabs ensconced in Damascus as a force the Brits/French had not counted on, thereby making them a political force to be reckoned with in subsequent negotiations. Lawrence hadn’t counted on generations of feuding between the various tribes ultimately collapsing any potential for them to work together as a cohesive political force. The results of the Sykes-Picot agreement split up the Middle East according to the extremely complex Paris Peace Conference of 1919. Britain was given much of what are now Jordan, southern Iraq, and the port of Haifa in Palestine to allow access to the Mediterranean. France was allocated portions of Turkey, northern Iraq, Syria and Lebanon. Russia got Istanbul and portions of Armenia. The division of Palestine was a special issue, crafted by Lloyd George of Britain, and is extremely complicated, much more that can be described briefly. However, Jerusalem ended up being carved up on the basis of the religious interests of the Allies, Brit Protestants, French Catholics and Russian Orthodoxies. 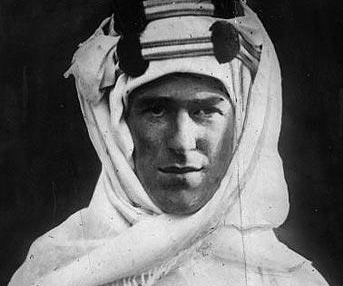 Lawrence eventually left Arabia frustrated and depressed at his failure to bring the Arabs to a political bargaining position with the allies. He never sought a political position of leadership again in his remaining lifetime, ultimately enlisting in the Royal Air Force as an aircraft mechanic, desiring nothing more than mechanical busy work (as described in his later book “The Mint”). In May 1935, Lawrence was killed in a motorcycle accident near London. Swerving to avoid unexpected bicyclists on a country road. He suffered an isolated head injury (probably a brain contusion) and died 6 days after the accident, never regaining consciousness. He was 46 years old. He rode a Brough Superior SS100 motorcycle, considered to be the Rolls Royce of two wheel vehicles at the time. It is currently on display at the Imperial War Museum in London and a stone pillar marks the site of his accident.